Another year of singing descended on Europe once again as this past weekend saw the annual return of the Eurovision Song Contest. This time it was hosted in Vienna, Austria after they won last year with Conchita Wurst and his song; “Rise Like a Phoenix”. Much like in past years though the winning song wasn’t really played at the beginning of the contest. It was heard briefly, but Conchita did not really sing until before the announcement of voting, but sang two songs, neither of which was last year’s winning song. This isn’t necessarily all that new however. Back in 2005, the 2004 winner; Ruslana from the Ukraine sang at the beginning, but it was not the same song as the one she had Won with, all though it sounded very similar, if maybe a bit slower. I do think thought the contest is losing something if the winning song of the previous year is not celebrated at the beginning, or played at all. This year’s presentation of the contest was terrific. The theme of “Building Bridges” was possibly a little over used, however for the most part it was used quite well. The presenting team of an all-female trio, plus Conchita, worked alright, I did however think that one of the trio had more time than the other two, and out of those two, one had more speaking parts than the other. It was a great improvement over the near jokers who hosted the event last year, but still had some chinks, and also some awkward moments of talking and speaking which were just un-needed. The presentation over last year though was a massive improvement. As for just the show (not mentioning the songs yet), last year was a bit disappointing. The set and other bits and bobs were pretty good, but the presentation left something of a sour note on the whole event, lowering my expectations a bit for this year. When the event started this year though, it reminded me of the kind of spectacle that Eurovision can produce if done to a good enough standard. The opening, was amazing; a nice combination of singing and pieces of music and video. The set pieces before each song, showing an Austrian Activity were really enjoyable (even if the accompanying song wasn’t so much). I did not get to see much of the big interval act, as I went downstairs to get some cake, but from what I saw, it looked pretty impressive. As for the voting, the ‘building bridges’ moniker was used quite nicely in a short animation before each country appeared to reveal their votes. The arena and set were brilliant, and provided plenty of features which were used to great effect. For next year, the caption should be: “Building Better Phone Lines”, especially after 3 countries suffered connection issues when announcing votes. This year’s selection of songs was a nice variety. I was a bit disappointed that the Finnish entry did not get through to the final, as I saw it a few weeks ago and thought it was pretty good. The UK selection for this year I genuinely thought was much better than most years. Its style and presentation looked like a piece of music from what I thought was 1930’s America, but could not help think that it sounded similar to a dance I once saw in Strictly Come Dancing during the 2013 competition. This year of course there was a lot of attention on a country that is not even in Europe (even though there are more regular countries that aren’t either); Australia. Australia’s song was quite nice and I did briefly wonder about voting for it. I think though that having 27 acts overall was possibly a bit too much and I felt like I was flagging a bit as the last few acts came. There was a lot of interesting acts this year. Belgium produced this weird thing that was well choreographed, but not exactly up beat. Azerbaijan brought back Elnur Hüseynov who entered back in 2008. Other countries of note included Serbia, Greece (with something that looked like a combination of Norway’s entry in 2013, and their own entry back in 2006) and Russia. For me though, it was between two acts. Israel and Georgia. Israel’s entry I thought was very boy band like (a bit like Spain’s entry in 2007), and a bit silly; however it was also very enjoyable. The only other song that I thought I liked more possible was Georgia’s entry which was very different, more like Gothic Rock. I quite liked it, even if the costume was very outlandish, making me think of Julianne Moore’s character in Seventh Son, and that wizard character in Warcraft 3. When it came to choosing for which one though, I chose Israel, but accidently voted for both of them. What happened is that when I voted for Israel, I typed in two extra numbers that weren’t needed, so I voted for Georgia, I tried again to vote for Israel, but did it again. I then voted again successfully for Israel. I decided though not to vote for them again two more times in hope of correcting it. As voting came, it was a surprise as it was quite a close vote between 3 countries, Italy, Sweden and Russia. It was a close race with Russia winning for a while until Sweden grabbed the top spot and held it. Several other countries did quite well though, including Latvia, Belgium, and even Australia finishing in 5th place, well enough I think to suggest a possible return for them. The UK suffered a bit only achieving 5 points, but did considerably better than France (4 points) and both Germany and host country Austria who both received no points. The big winner for the evening though was of course Sweden finishing on 365 points (just 22 points away from Norway’s record victory in 2009) with the song Heroes sung by Måns Zelmerlöw. The song I thought was actually pretty good and the dance and animations were quite fun and a good song to finish the night on. Sweden’s victory in 2015 makes them the second country, after Denmark to win twice since 2000, but also, with 6 wins to date, Sweden is no the second most successful country in the contest history, just 2 more wins and it takes the top spot from Ireland. Altogether it has been a terrific year for the contest, and a great way to celebrate its 60th Year. During 2014, I took part in a reading challenge on Goodreads where I read 25 books in a year. Originally I had set the challenge to read 10 books in the year as I am something of a slow reader, but due to reading a selection of picture books, a comic and a couple of small ones, I was quick to surpass this target. So I kept on expanding it by another 5 books and by the end of the year, with a little bit of a struggle, I had read all 25 books. The books I read last year were some of the best books I have read my whole life (so far) and for several months now I have been wanting to do a post about them. So here are my Top 5 favourite books that I read in 2014. 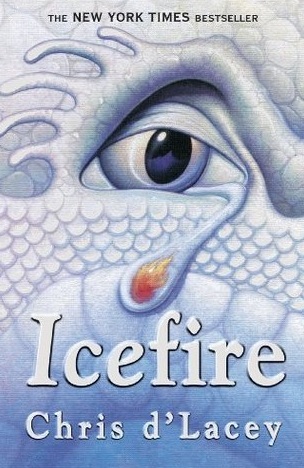 5: The Last Dragonslayer by Jasper Fforde – I had not heard of nor read the works of Jasper Fforde until one of my lecturers at University posted an email about him coming to do a talk at the Uni. I did not think much more of it, but then my Lecturer suggested that I read The Last Dragonslayer as it would help with my assignment. I bought a copy of it, which was rather hard as it was not available on the shelves in Waterstones, though thankfully, I was able to order it through them. The first half of the first chapter just went by like a blur and I could not remember anything about it. The rest of the book though, I remember fondly. The story is about Jennifer Strange who is the acting head of Kazam, which is an employment agency for wizards. Times are tough for Magic and there is a lot more paperwork than there used to be, and things are going to get much harder for Jennifer, as she is destined to slay the last Great Dragon in the Ununited Kingdoms. The Last Dragonslayer is a book aimed at a teenage, possibly Young Adult audience, but I was able to just get engrossed in it. It is such a funny book, I just wanted to continuously burst out laughing as I got closer and closer to finishing it. I can’t stretch out enough how funny it was. It had references to the modern contemporary world, with the mentions of cars, business, employment and paperwork, but also had a deeply rooted world of magic and science. It’s also quite an easy read. I just loved this book throughout, such an enjoyable read. 4: FEAR by Michael Grant – I worked out it took me somewhere between 8 and 10 months to read Michael Grant’s GONE series, but today, even after reading so many other books and other series, it is still my favourite series of books. In December 2013 I started reading FEAR, the penultimate book in the series, and at long last; it was the cover of FEAR that got me interested in the series in the first place. FEAR is the fifth book in the series and takes place after the events of PLAGUE, and things could not be worse for the boys and girls of The FAYZ. With the town and other areas they have lived been almost completely destroyed by both themselves, and the unnatural forces that reside in The FAYZ, they have finally begun to settle down, but there are dark forces both inside the dome, and outside. Inside, the town is about to rebel against its leaders and outside, a sinister plot is underway which could spell the end of those inside. But amidst all this, there is something much more powerful growing. The thing I found with the GONE series is how it is written to make you feel something more as you read it, not just affection or a connection to the characters, but makes you see or feel something more at work. I have referenced FEAR as the calm before the storm. The final book in the series has a lot of chaos and anarchy, but so does the first 4 books, but that grows more gradually. By the time you finish PLAGUE, you sort of feel rather paranoid as things get worse for the characters and the world. In FEAR though, there is a lot of times for peace and reflection, and while things do get chaotic, it’s more in a building form which saves the rest for the last instalment. FEAR also does one thing the other books have not done yet, which is explore the world outside the FAYZ; How the families of the children are doing, what the news coverage is reporting, but also what has happened to those who have escaped, and the armies Interest. FEAR then is not so much a rampaging assault on the characters inside like the first four books, but more of a supernatural conspiracy which sets everything up, for the final chapter. Due though also to its more natural calm pace, FEAR is such a beautiful but also calm read, that it becomes not just one of the best books in the series, but also, a lovely standalone book in its own right. 3: Jurassic Park by Michael Crichton – I had known for many years that Jurassic Park was originally a book, but I had not once considered reading it. It was only due to me wanting to do an adaptation of it for my University Degree that I decided to read it (the adaptation piece was the story re-told from the point of view of the Tyrannosaur). I went into it figuring that it would be a lot like the film, however it wasn’t; it was a lot better. I am a big fan of the film, but the book does things a lot differently. It begins in a way that starts with minor characters and some that are only heard from in no more than 1 chapter, but then it develops into something more recognisable. The characters though appear to be a lot different than they are in the film, but there are more developments and there is a real sense of who you want to boo and cheer for. Jurassic Park also has a great vision for its dinosaurs and even has a level of science in them. This science feature takes up a lot of the books dialogue, however, it is at no point; boring. It is actually written in a very interesting style that reads more like someone talking to you, instead of either lecturing you, or being written down in a text-book. It was really interesting, but in comparison, there is also a lot of mathematics as well as business, investing and corruption. It is not just a science book with the added treat of dinosaurs; it is also an insight into what lengths people will go to, to get what they want. Let’s not forget though, that at its core, Jurassic Park is an adventure, an adventure into a lost forgotten world as dinosaurs are brought back to life, and terrorise the lives of those, who have never encountered them alive. Yep, it sounds just like the film, but the book is more than a film, and is better for it. 2: Micro by Michael Crichton and Richard Preston – While reading Jurassic Park, I got interested into reading more works by Crichton. One I found in Waterstones was Micro. I did not know anything about it, was the first time I had seen it. I took a look and liked the sizing of the letters and line spacing. I looked into it, and decided to read that after I finished Jurassic Park; which I did, and liked it more than Jurassic Park. Micro is the last book to be written by Crichton who sadly passed away after finishing only a third of it, to which Preston was brought on board to complete. Micro follows a group of students as they are brought to Hawaii as part of an exciting opportunity to work for a new start-up company. Things take an ugly turn however and soon they find themselves in a world they know, but have never studied so close up before. They now have only a few days left to undo the damage done to themselves, but first have to survive a dangerous new world, that up till now, most people have taken for granted. Micro is a lot like Jurassic Park in the sense that it is very scientific but also a great adventure. It is filled with multiple perils and dangerous moments, and just like a great adventure, not everyone survives. In this we also have a selection of interesting characters, weird science and both a level of state of the art technology and; as far as I am aware, biotechnology that does not exist (yet) but appears so real. The stories biggest shock though comes in its first few chapters as while your mind is thinking one thing, you don’t see the other thing coming. In what I think is a book far better than Jurassic Park, Micro is such an enjoyable, yet both intriguing and interesting book. 1: LIGHT by Michael Grant – What is easily both; my favourite instalment in the GONE Series but also My Favourite Book. When I started reading it, with in just a few minutes of starting, I could not stop. Basically, everything comes to a head as those inside the FAYZ are in great danger as the Darkness has been reborn. As things get worse on the inside of the dome, things are advancing outside also and it appears that simply escaping the FAYZ, might not be such a great idea for some of the book’s main players. LIGHT is a non-stop, pulse pounding action thriller. It begins rather simply, but within a few chapters, there is chaos everywhere leading key players to meet their fate and untimely ends as they take on one of the most powerful entities in existence. Behind all this though there is still time for emotion, compassion and experience the lives of those who you have become attached to and fond of for six whole books. There are moments of regret and redemption for former villains as well as moments of great powers and raw destruction from others, and when the end comes, it is not really the end, as the book then delves into what happens to the lives of those who are still alive as some face uncertain futures. I really love this book, there was just great moments in it and it quickened the pace as it went along as the final battle approached. But the death of a certain character, a really good one, slowed it down enough for me to reflect. And then, as it reached its ultimate conclusion, came judgement day as some characters face a hard struggle, as some are made scapegoats and face criminal charges. But the story wraps it up beautifully and ends in a really nice way. It ends just the right way, with a finished, completed story, and one that I so far have not read anything like since. GENEPOOL (My Goodreads challenge for this year is to read 15 books in a year). This past Sunday, just before and after a Fellowship Meal at church, I drew a picture of the Loch Ness Monster in a Thunderstorm. I was basically just standing around near what is now the former bookstall, and I saw some paper, felt tip pens and a clipboard. Just out of the corner of my mind I wanted to draw a picture. So I took my writing pen and used it to draw the picture at the top of this post. 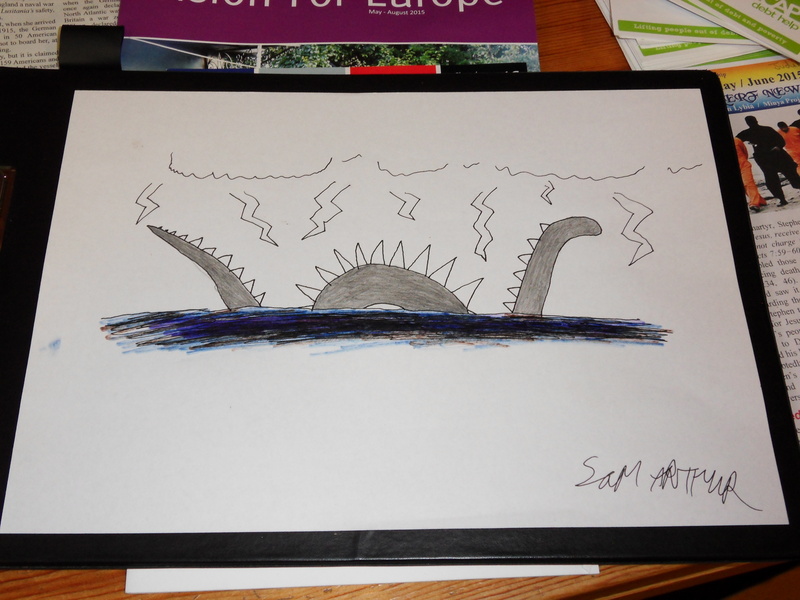 I did not originally intend to draw the Loch Ness Monster. What was going through my mind at the time were those excellent shots during the opening and early to mid-parts of the 2014 Godzilla film, with Godzilla’s spines protruding out of the water like a shark fin. I actually quite like that effect and the accompanying soundtrack, and since the film’s release have watched those scenes every now and then. When I was about to draw the picture, that was what I wanted to draw; a landscape picture of the spines rising out of the water and moving along. However I could not figure out how to do it. I had an idea, but to get the right impression, it needed some kind of form below the spines, but still risen out of the water. Instead I just drew the neck, body and tail of the Loch Ness Monster rising out of the water, just because really; and then added spines on the back. I decided not to give the Monster a face as I did not know how to present it. While the Monster has not necessarily been presented with spines in the past, I thought giving it some in my picture would give the creature a much darker look. The thunder-storm came as wanting to have something more in the picture while still presenting it as dark as possible. As for providing colour, I decided in the end to keep it minimal, just have a water effect and colour for the creature’s body. That was still rather simple though. The neck, tail and body of the creature was done using a standard pencil, while the water was a blue, brown (because I thought it was black) and purple felt tip and my drawing pen. While it is still very minimal, I think it works. I actually quite enjoyed drawing my little picture. I already have some ideas for other pictures, although I am not really considering becoming an artist. I just fancy drawing some more pictures like this, ones with monsters in of course, but possibly with some other things going on. I quite like the idea of having a creature hiding behind a Nuclear Explosion (not necessarily Godzilla, but that could be an option). I still fancy producing Godzilla’s spines rising out of the water at some point; but I am not going to rush it. Instead I am just going to enjoy my picture, and enjoy the next time I produce one. 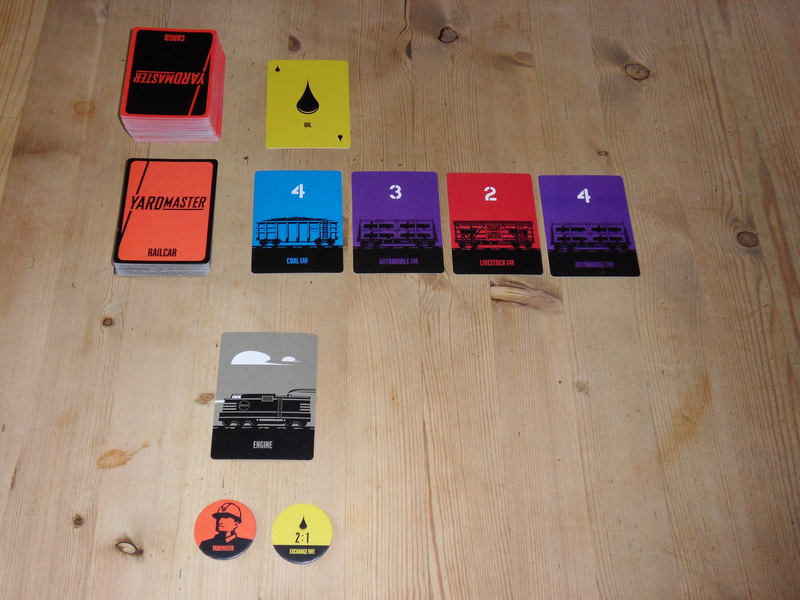 Yardmaster is a set collection game for 2-5 players from Crash Games and designed by Steven Aramini. 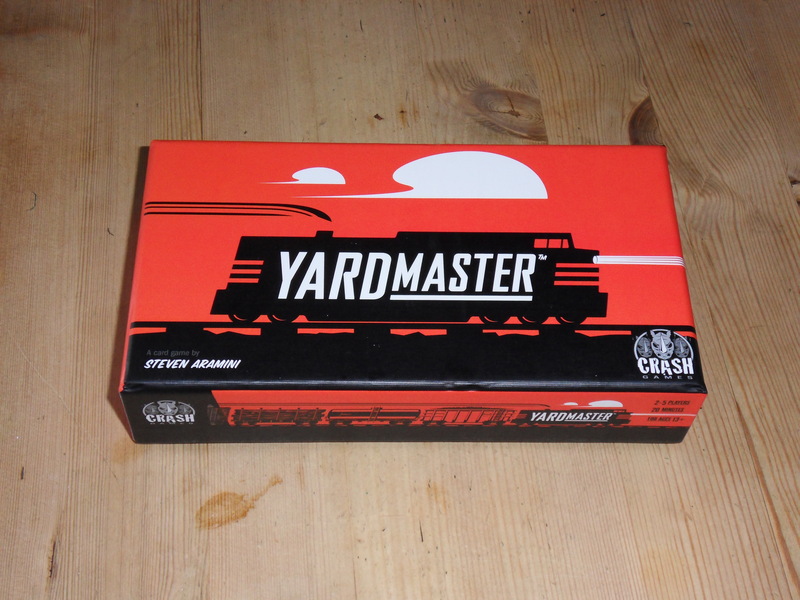 In Yardmaster, players build up the line of a freight train, adding different types and sizes of cargo onto one another until one player reaches the score limit to win. 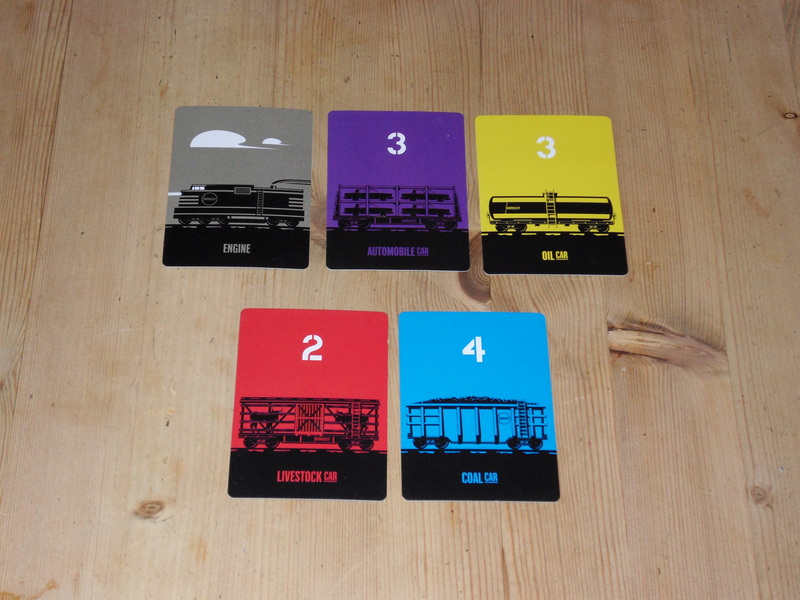 Players start out with a basic train engine and a set of coloured cargo cards. In the centre there is a draw pile for railcar cards with some set out in the middle for players to choose from. There is also a draw pile for cargo cards and everyone begins with an exchange rate token of a specific colour. The person who was most recently on a train goes first and gets an extra token to use once on his turn. On their turn a player can do up to two of three optional actions. First, they can draw a cargo card and add it to their hand. 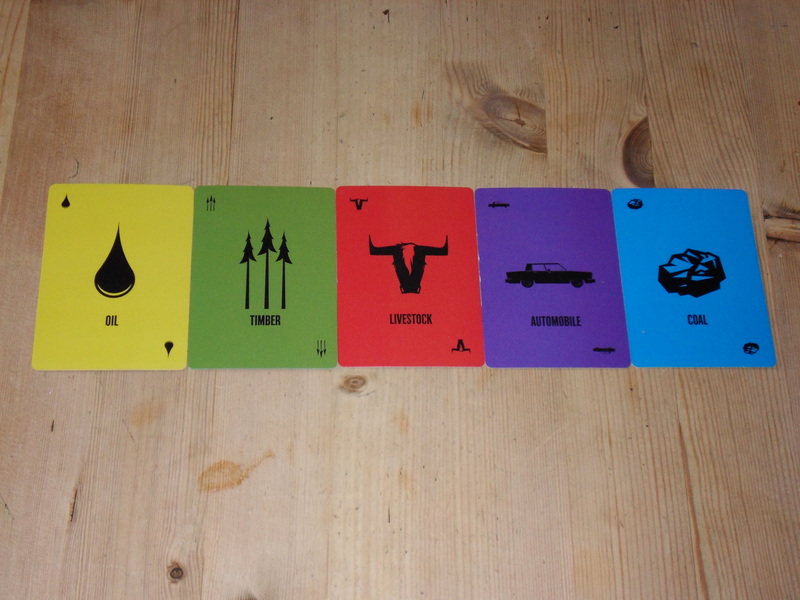 There are 5 different colours of Cargo Cards: Green – Timber, Purple – Automobile, Red – Livestock, Blue – Coal, Yellow – Oil; and together they are the main form of currency in the game. The second action a player can do is purchase a railcar from the arrival yard. The arrival yard is in the centre of the table of which 4 are available to purchase. Each railcar represents a different kind of cargo and for so many points. In order to purchase them, players spend the correct number of cards and the correct colour of cargo for each one. So for instance, if a player wants to purchase a Yellow railcar worth 2 points, they would need to discard two yellow cargo cards. Upon purchasing the railcar they can then add it to their train; however it is not that simple. The third action that players can do on their turn is swap the exchange rate token they have with that of another player. 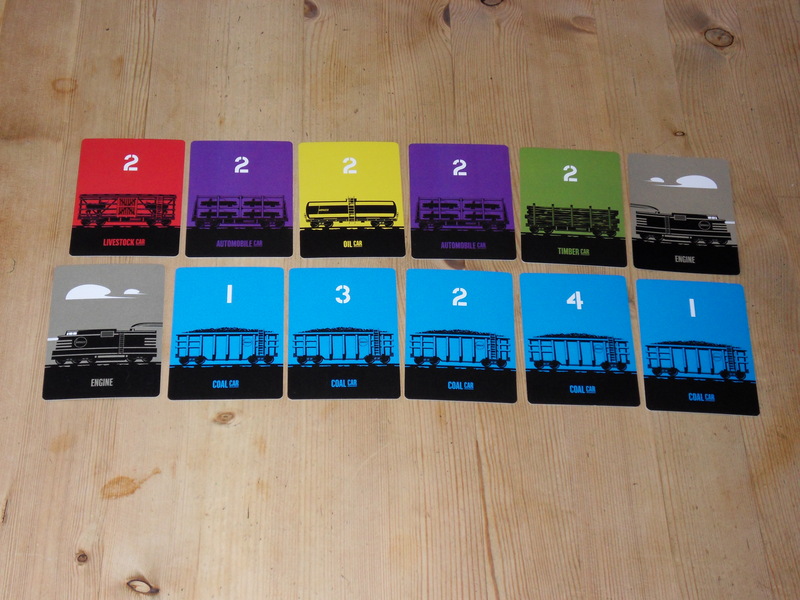 Exchange rate tokens allow players to buy railcar cards of a certain colour, with cards of another colour. Basically, when players are short on a certain colour of cargo card, the exchange rate token that they have, represents a specific colour of card. For instance, if a player wants to buy a green 3 railcar, but only have 2 green cards, depending on the exchange rate token that they currently have; purple for example, they can use two purple cargo cards in exchange for one of any colour (in this instance; green). Buying rail cars is the main mechanic of the game and is how a player wins. Building up a chain of rail cars though is not as simple as it sounds. The first railcar that is added to a player’s engine can be of any number and colour, no problem. After that however the player will need to think clearly as to what to buy and add next. You see, in order for another railcar to be added, it needs to be at least one, of any of the two factors of a railcar; those being colour and number. 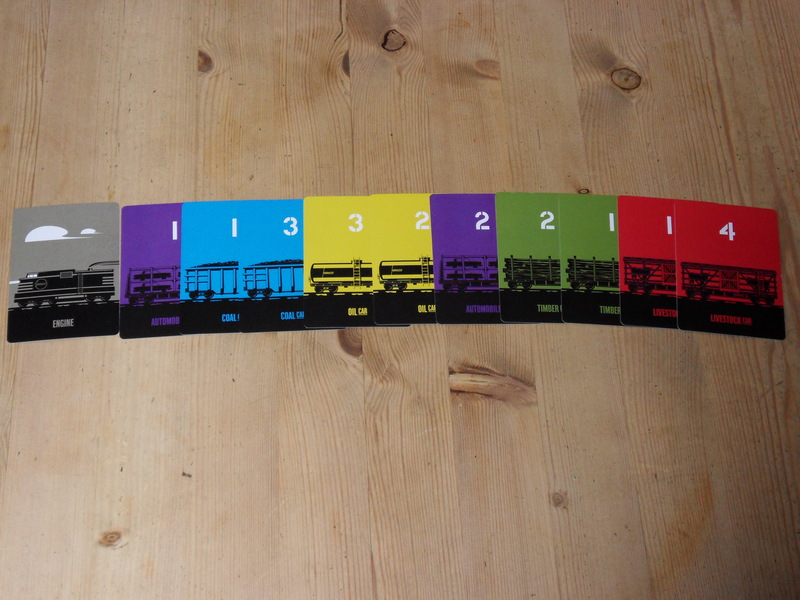 If the player had bought a purple railcar with a value of 3 and added it to their train, the next card would have to be either or both the same colour, or same number. So if they bought a yellow 3, no problem, it can be added to their train. If however they bought a red 2, they would not be able to add it straightaway, because it is a different number, and a different colour. Players will therefore need to think a little more tactically about what they purchase. Any cards they purchase but cannot immediately add, they will have to store them in the sorting yard below their train. If space for that card becomes available though, so it matches either colour or number; they can then add it for a free action. Other things that can be done in Yardmaster include using Bonus cards which allow certain actions to be done differently, such as using an exchange rate token 1:1 instead of the usual 2:1. The other major thing is the Yardmaster Token. The Yardmaster token allows the player who has it to do 3 actions during their turn instead of the usual 2; however, if they don’t use it on their turn, they lose it, just as if they did use it. It is then passed to the player on the nearest right. This is actually quite a clever mechanic. Because it is passed to the player on the right, and play goes in a clockwise motion around the table, when you use it, it will be the player who was before you that will get to use it next and it can be a long time before you get to use it again. This is especially the case in a game consisting of 5 players, and can be punishing if you forget to use it, when you have it, because then someone else may get to take an advantage that you did not use on your turn. For what is basically a small game that can be played in the space of about 30 minutes, Yardmaster is actually a very clever game with a level of complexity so that it has plenty of depth for most players to enjoy while also not being too difficult neither. For one, it is a very colourful game, which on the whole is actually quite nice to look at and is not completely restricted to just a few colours. 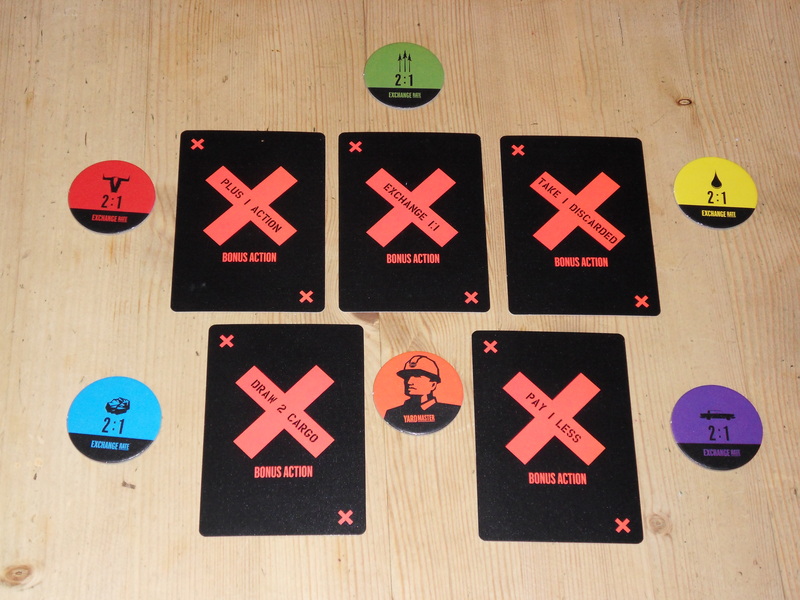 Some of the coloured cards are also nice and bright to look at making it not much of a grim game to look at neither. It is in the game core play though that it stands out the most. I think it is rather similar in mechanics and play to Ticket to Ride and UNO. Collecting enough cards to buy specific types of rail car is a lot similar in my opinion to the collection and placement mechanic of picking train cards and placing them on the board in Ticket To Ride. It is the main score tactic however, where you need a certain colour or number to add to your train that is like playing cards in a game of UNO. Together they make quite a fascinating method of play. One which takes time to build up a collection of cargo cards to buy rail cars, but then, it’s not as simple as just adding them. You need to therefore buy certain types to make up your train. Therefore; players will need to think more tactically about how to play it. Do they buy rail cars of a certain colour, or perhaps number, just so that they can consistently add new rail cars as soon as they purchase them, or do they buy what they can and think of logistics later. Either way, it requires a more in-depth level of thinking rather than just getting as many cards as possible and then just straight up adding them. The addition of the exchange rate and tokens is an added bonus, as it allows players to still purchase rail cars, even if they don’t have the correct value of cargo cards in their hand. On the whole, Yardmaster is a really fun game. Its design is nice and colourful as well as having a basic art design. Its core mechanics make it easily accessible to everyone from new, to the more veteran players and can be played in a short enough amount of time as well as be long enough to enjoyed to the full. Alltogether, Yardmaster is a lot of fun with plenty of in-depth gameplay, but is still simple enough for most people to just pick up and play.